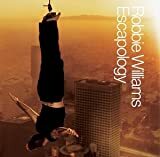 Robbie Williams', "Road to Mandalay"
good song marred only the Endless repetition of these bbbs.. sounds like robbie got writers block! Robbie Williams', "She's the One"
She's the one what? The one person who would listen to this song without trying trying to kill you and/ or herself, Robbie?